The wait is over, and the battle date is set! 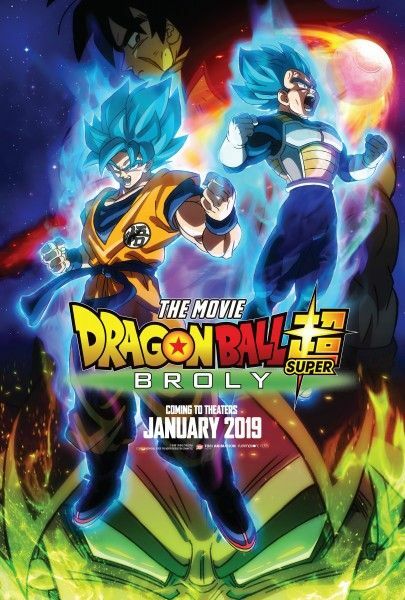 Super Saiyans Goku and Vegeta will gather to face their most powerful foe ever on January 16th – the official theatrical opening date for Dragon Ball Super: Broly, announced today by Funimation Films. The 20th film from the franchise and first from the Dragon Ball Super series, Dragon Ball Super: Broly is based on the original story, screenplay and character designs of creator Akira Toriyama and features an updated art style reminiscent of the classic bestselling Dragon Ball manga series. To celebrate the new film, Funimation will host a star-studded red carpet world premiere of the English dub on Thursday, December 13th at the historic TCL Chinese Theater in Hollywood. Expected guests will include the stars of the English cast, celebrity guests and studio executives. As earlier announced and as part of the film’s promotion, a Dragon Ball Super: Broly panel will take place at New York Comic Con 2018 on Friday, October 5th at 6:00 p.m. in the Hulu Theater at Madison Square Garden. The newly expanded list of confirmed special guests consists of Masako Nozawa (original Japanese voice of Goku), the film’s director Tatsuya Nagamine, Sean Schemmel (current English voice of Goku) Christopher Sabat (current English voice of Vegeta), Monica Rial (current English voice of Bulma and panel emcee), Jason Douglas (current English voice of Beerus), Ian Sinclair (current English voice of Whis) and Vic Mignogna (reprising his role as English voice of Broly). Dragon Ball Super: Broly follows the events of the hit anime series Dragon Ball Super, the first new Dragon Ball storyline from original creator Akira Toriyama in more than 18 years. Since premiering in summer 2015, Dragon Ball Super has propelled the popularity of the franchise globally – with both lifelong fans and a new generation of children and teens. The last Dragon Ball film, Dragon Ball Z: Resurrection ‘F’ (2015), was a box office hit – grossing $8M in North America to become the first independent film to make the Top 10 list of highest grossing anime films domestically.